The oil and natural gas lobby is working hard to prevent the Environmental Protection Agency from establishing safeguards to protect the public from chemicals used to produce shale gas through “hydraulic fracturing,” also called “fracking” or “fracing.” Oil and gas companies use fracking in combination with horizontal well drilling; the process involves injecting a mixture of water, sand, and chemicals at high pressure into rock formations thousands of feet below the surface to fracture the rock and allow oil and gas previously trapped inside the rock to escape. Recent advances in drilling techniques combined with fracking have dramatically expanded the supply of technically recoverable shale gas. But studies show that the chemicals may pollute nearby sources of water. 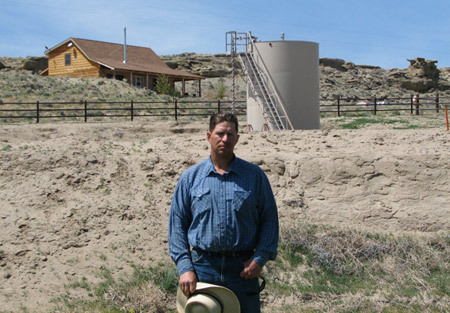 The Safe Drinking Water Act loophole isn’t the only exemption natural gas producers enjoy. They are also free from reporting the specific toxic chemicals used for fracking, even though many other industries must report their toxic emissions under the 1986 Emergency Planning and Community Right-to-Know Act. The natural gas industry’s most common defense to these claims it that fracking fluid mostly consists of water and less than 1 percent is chemicals. Yet OGAP reports that, “The draft EPA study included calculations showing that even when diluted with water at least nine hydraulic fracturing chemicals may be injected into [underground sources of drinking water] at concentrations that pose a threat to human health.” Of course, this fact never made it into the final EPA report that led to the fracking exemption. Homeowners and communities adjacent to natural gas production facilities that employ fracking have the right to know about the toxic chemicals used at these sites. And without information from the natural gas industry on what chemicals it uses, it will be impossible to conclusively state that the practice poses no danger. The issue of public disclosure is not an idle debate without public health consequences. Congress need look no further than a 2008 Colorado case, where an emergency room nurse was sickened and nearly died after she treated an oil and gas worker whose clothes were soaked with fracking fluids. The nurse, Cathy Behr, said the physician who treated her was unable to get information on the chemicals she was exposed to and had to guess. “It was the right guess, because slowly I started getting better,” Behr told the Durango Herald. Some natural gas companies, notably Chesapeake Energy Corp., Range Resources Corp., and Schlumberger Ltd, have expressed a willingness to disclose the chemicals used in fracking. Announcements by CEOs of Chesapeake Energy and Range Resources on the need to make this information public followed twin events that bore ill tidings for the industry: spills at drilling sites in Pennsylvania and proposals for new regulations in New York. Yet much of the natural gas industry continues to fight reasonable measures to protect the public health and environment. The industry claims that state regulation of hydraulic fracturing is sufficient but at the same time they fight more effective state oversight. Colorado recently added new oil and gas drilling rules that require companies to disclose fracking chemicals to the state, for example, and the industry is suing to overturn the new rules. Natural gas producers should be required to make public and accessible information on the chemical components of fracking fluids rather than perpetuating the existing exemptions from the Right-to-Know program. Many gas producers are concerned that this would reveal their trade secrets, but the TRI program has a process to protect such proprietary information without forcing them to reveal trade secrets. And the EPA has acknowledged the need to deal with trade secrets in TRI submissions. And even if the EPA approves an industry’s claim of trade secrecy, there is still a provision to protect public health by allowing states to identify the health effects associated with the chemicals and make that information public. Natural gas emits half of the carbon dioxide pollution compared to coal and can serve as a bridge fuel to a lower-carbon future. Processes that make shale gas production possible, such as fracking, can help speed this transition. But we need to pursue this cleaner energy future in a sustainable manner that does not come at the expense of public health. Sarah Collins is an intern on CAP’s Energy Opportunity Team and Tom Kenworthy is a CAP senior fellow.